I have a few friends that absolutely refuse to eat mushrooms. I think they are pretty good myself. I like them with swiss cheese on a burger. They have to be fresh though, I hate going to a place that makes them with those sad, soggy canned mushrooms. One of my anti mushroom friends brought me a wild mushroom in a jar that a friend from work had picked. That one I decided to pass on. i like mushrooms. fried mushrooms are pretty good. first post again! why did half my reply dissapear -_-;? anyway, its reminded me of tensious D : pick of destiny. Another great comic! One question though, where exactly do I vote for this comic? I always scratch and sniff mushrooms before eating them. My favorite mushrooms remind me of cinnamon. 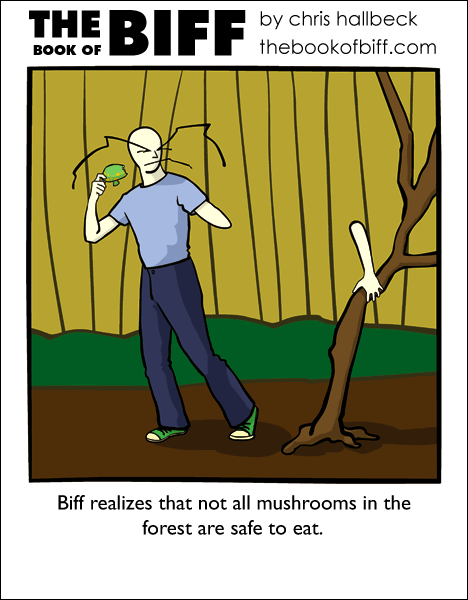 Good muchrooms shouldn’t make Biff feel detached like that. wort, your reply disapeared cause you cant use the opposite of > without it disappearing. I’ll start adding some new voting incentives in July. My mom hates mushrooms. The cooked ones remind her of slugs. I, personally, have never tried them, but I doubt I will. Hey! My arm! I…*need* that. The specially pickled ones are the best. I like shrooms. Perfect side to eggs and sausage. Mushrooms I like on certains, and uncooked also. I really like portabellos too. I am one of those people that refuses mushrooms. They get their nourishment by feasting on death, decay, and poo. I’ve tried them and the texture is bleh. Bleh I say! Do not want. i agree with Rob! Bleh he says and i echo! Bleh! Ew, I always hated mushrooms. They’re just.. Icky and.. Weird. I probably because when I kicked a wild mushroom, there were worms in it. @Radical Edward; o__o I live in Central New Jersey also. Nice comic you have here, I spent the last three days looking through the archives when I had time and had a ton of laughs. I like Biff’s expression in this strip: he’s like, wtf just went wrong? XD Keep up the good work! Biff MUST be immortal. His parts such as his head and now his arm keep growing back. Mushrooms are great!! without mushrooms mario would never get high and without that there would not be any bipod turtles that fly or have a flying clown neither would there be any dinosaur that makes everything into eggs or bombs and bullets with faces and emotions and that all rated for friggin’ kids Miyamoto used shrooms when making mario bros. and you know it!! in in the British Virgin Island of Tortola mushrooms are legal. You can get mushroom tea at the pubs during the full moon parties and…. oh we’re not talking about THOSE mushrooms, are we? XD he looks like that a lot of the time. And Thou hast commented on the day after my birthday. I’s 17 now! I CAN GAMBLE! (joking). i’ve always hated mushrooms ever since my dad started his car and there was a mushroom behind the exuast pipe and the shroom exploded…..
Obviously,Biff has fallen down the rabbit hole. Tell him to say hi to the Hatter for me,will ya? Let’s be HONEST here. Based on your style of comics….I’d have to say YOU have done MAGIC mushrooms LOTS of times….despite what you might try to convince us of. It’s not just THIS comic, but the 275 you’ve posted up to this one as well. The shrooms I like are beige with the blue vein in the middle. I’ve never had body parts detach, but I HAVE had a sensation of my bare feet becoming ROOTED to the ground though. THAT was pretty trippy. My mom slipps small chopped mushrooms in with homemade pizza. I don’t like that. Texture’s important to me in my food, so any shrooms have to be cut up small, so’s I don’t actually have to bite into them and get that crunchy squeaky texture. I like the taste, though. I like portabello mushrooms. My favorite food is mushroom chicken. XP Mmm… Death-festering fungus!! Yum yum yum!! badger badger badger badger badger badger….. There is a mushroom factory that is a 2 min drive from my house. My dad and me go by every so often and buy a brown paper bag of extra large mushrooms for $4…. there is about 4 or 5 pounds of mushrooms that were too large to be canned or packaged in there. :3 When I was leetle me and my friends would buy a bag and see who could eat the most mushrooms. The record is 46. Mushrooms are great. But picking them wild is dangerous. And if you are going to pick them in an industrial area i would suggest bringing a geiger counter. I love mushrooms, the fresher the better. But I absolutely LOATHE those canned ones. Can’t stand them! When I was a kid, I used to think I hated cooked mushrooms, but in reality, I just hated canned mushrooms. Quote from a mushroom identification guide: “There are old mushroom hunters, and bold mushroom hunters, but no old, bold mushroom hunters.” If you are not one hundred percent sure of the type of mushroom you have picked, assume it’s poisonous. Dangit, Chris, you’ve made me hungry now. Is he losing his limbs, or is he just Hallucination? my parents always used to take me out mushroom picking as a kid, was fun, but we always had to make doubly sure we picked the right ones.